Raul Villar, CEO, AdvancedMD Gone are the days when medical practices needed dedicated computer experts to update the software in their IT departments. There is a rising trend that stands to combat the security loopholes of local storage, reduce the paper footprint of electronic health records (EHRs), and even deliver a new brand of patient engagement telemedicine that fosters communication between the practice and the patient significantly. 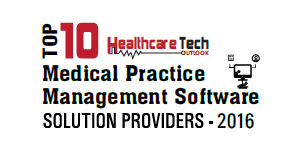 With this new approach to practice management, the solutions provider is able to frequently update and simplify the use of the software that manages nearly all of the billing and EHR aspects of each practice. So what is it? If you guessed the cloud, you’re where AdvancedMD was in 1998. They were the first cloud practice management solution in the market and had a vision of 100 percent cloud-based system that delivers a completely integrated workflow. For the next 18 years, they set about seamlessly combining the different user experiences and workflows that came with client/server applications, merging software dedicated to practice management, clinical record-keeping, benchmarking, integrated patient engagement and telemedicine. What they came up with would raise the standards of EHR and the healthcare industry as we know it. "With Advanced Patient, what we’re trying to do is give patients the ability to control their healthcare experience"
“From our perspective, what we’ve tried to do is deliver a truly integrated workflow from not only the practice management tool and the clinical tool, which is the EHR, but also patient engagement tools that help enhance the patient experience. We’ve also integrated telemedicine and business intelligence solutions,” explains Villar. AdvancedMD’s analytics solutions allow them to remain more productive with less effort while allowing physicians to comfortably navigate through streams of important information. These solutions, AdvancedInsight® and AdvancedBenchmarking®, not only bring great advantages, but also highlight the benefits of working with a cloud-based platform. Advanced Insight ® allows physicians to take raw data from their systems and create insightful information. It allows them to accurately see where patients are coming from and going, what treatments get the biggest payback and the least reimbursement, and other aspects of medical billing to manage the business aspect of their practices more effectively. On the other hand, the AdvancedBenchmarking® enables a practice to comparatively look at their physicians and productivity in their specialty against the region, national average and any of the other 25,000 providers in AdvancedMD’s database. With the cloud, AdvancedMD alone can update the information on all of these clients at once, as well as upgrade their software. Physicians aren’t the only people AdvancedMD caters to with their solutions. “With Advanced Patient, what we’re trying to do is give patients the ability to control their healthcare experience,” explains Villar. This is done by letting the patient go online, create the intake forms and use them to create a portable record. From there, patients can then give their demographic information, history, medications, and sign any consent form once and never have to be burdened with filling out that same information again. It is made available online to other specialists and physicians, and can even be filled out at a medical office with AdvancedMD’s iPad and kiosk solution. With a large provider base, AdvancedMD is not only held to a standard of quality, but also compatibility. Many independent physicians value the ability of being able to send information wherever they want, especially to other physicians. “Our platform is fully extensible,” states Villar. “With our CCD and CCDA, we have the ability to export our information to any other platform.” This means that AdvancedMD doesn’t have to be up to speed on whether the future of healthcare is accountable care organizations or the continued migration of healthcare systems. Their software guarantees that medical professionals will always have a way of sharing patient information with one another. But, since the platform stores a significant amount of Protected Health Information (PHI) that can be distributed between physicians, doesn’t that carry an increased demand of security? Of course it does, and according to Villar, AdvancedMD is more than well-equipped to take on that challenge. “We were previously owned by ADP which is a Fortune 100 company so we were fortunately forced to raise the level of our hosting, security and data integrity,” elaborates Villar. As most violations of PHI includes the theft of paper records and actual hardware, it turns out that cloud is the safest place to store medical data. Paired with the firewalls and infrastructure that AdvancedMD provides, this software brings an entirely different standard of security to medical practices everywhere. In addition, AdvancedMD offers two methods of medical billing that leverage the power of their cloud-based platform: customers can do it themselves or have a team do it for them. Following the line of reasoning behind the former, practices can use the application check in, schedule and bill their patients. They can also use the patient engagement tools to send patients reminders that they’re due for checkups, which can be tremendously helpful when it comes to the collection process. With 80 percent of today’s healthcare costs being generated by 20 percent of people, the majority of whom have chronic care issues, the ability to manage those patients is key for a thriving healthcare business. On the other hand, for a little bit of extra money, practices can bring in a billing team to manage the responsibilities of payment posting and collection. Using the same technology stack that powers the rest of their platform, AdvancedMD’s billing team leverages their practice management system for charge entry. This arrangement functions on the principle of aligned financial incentives by allowing AdvancedMD to keep a percentage of the revenue their team collects. If they fail to collect the money, then both parties expend their resources for little to no gain. This incentivizes the billing team to work even harder to ensure that they keep the trust of their clients. With a 99 percent clean claims rate, AdvancedMD is well on its way to dominating the market with its practice management platform. They are not only selling software that any computer literate person can use, but also delivering ease of use with compliance. With this platform, physicians can enjoy an easy-to-understand experience while complying with Meaningful Use Stages 1 and 2 and ICD 10, along with other regulatory standards. In addition to that, AdvancedMD is constantly working with external research, focus groups and advisory boards for different products. This is instrumental in making sure that they deliver a workflow that not only works, but makes sense for the physicians that use it. “If we think about companies like Salesforce.com, there is an ecosystem that surrounds the platform and enables people to leverage their APIs and build products on top of their products. That’s ultimately where we’re going,” continues Villar. Along with interoperability that spans the entirety of their space, AdvancedMD is also delivering a truly integrated workflow. There is no rework or double entry into their systems. If that isn’t impressive, the cloud-based architecture system allows them to update their solutions at a minimum of two times a week for their 100,000 users across its 25,000 client-base. This, in addition to AdvancedMD’s vibrant, collaborative work culture, is what has been pushing the healthcare industry forward into a new era of cloud and big data analytics.